Launching my food line, Nourish Snacks. It has been a lifelong dream of mine to create a healthy and delicious snack company that people can trust. It’s surreal that my dream is now coming true. My snacks, which come in 25 varieties, are portion-controlled, all-natural, low in calories and totally good for you—you don’t even have to flip them over to look at the nutrition or ingredients because I’ve already obsessed (truly). All I want to do now is sit in my kitchen and create more yummy snacks. The movie “Chef.” This film combines all the things I love: comedy, food, adventure and a little social media thrown into the mix for good measure. Plus, it’s about following your passion and living your dreams. You have to love that storyline! My new puppy, Gatsby. Look at that photo above—enough said! Binge watching “Friday Night Lights” (all five seasons). I wouldn’t know a touchdown from a third down, and yet, I’m completely hooked on this series that focuses on high school football in Texas. My son asked if I’d watch an episode with him, and that one episode turned into five full seasons, which I watched huddled over my iPad during an entire family vacation. Nonfat plain Greek yogurt. This past year I discovered just how versatile this thick, creamy and packed-with-protein pick is. For instance, I use it as a main ingredient in my skinny Garlicky Spinach Dip and Loaded Potato Soup. My new show “Food Remedies” onPBS. I’ve always been an advocate of public television. I grew up on it, I relied on it when my kids were younger, and now my hubby and I enjoy all their history and science programming (we’re huge fans of “Downton Abbey”). 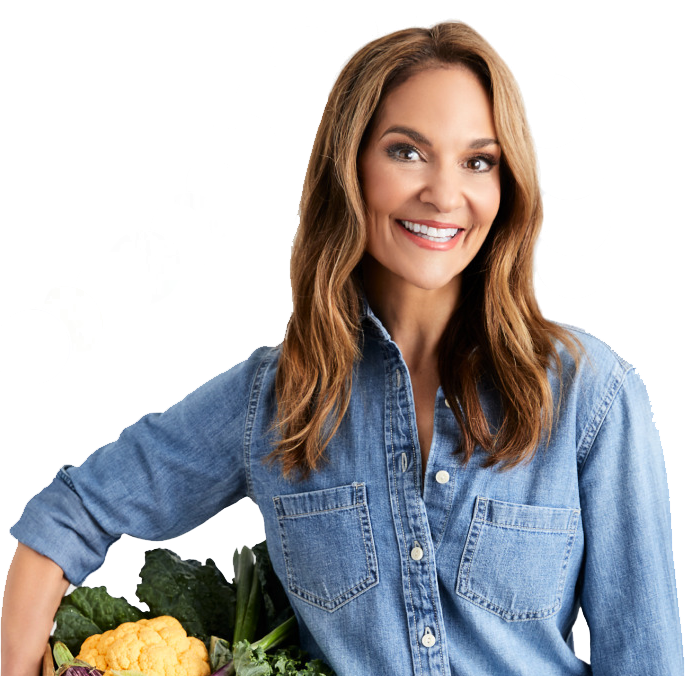 This year, I was able to team up with them to create a one-hour special called “Joy Bauer’s Food Remedies.” Not only do I get to share life-changing, cutting-edge info with a wide audience, but I also get to help PBS thrive by encouraging donations. It’s such a rewarding experience. Inventing my PB Banana Freeze Pop. Healthy meets decadent in this sweet surprise, which I crafted in my own kitchen. It’s definitely my favorite healthy frozen snack of the year. Teaming up with The Clinton Foundation. This year I joined forces with their Alliance for a Healthier Generation initiative, which is focused on helping reverse childhood obesity. It was a huge honor to spend time with President Bill Clinton, and I was thrilled to help celebrate teachers who are making a true health difference in schools across the country. Crafting a slim-style Long Island Iced Tea. We have a family home in the Berkshires (my favorite place in the world after New York City), which is where a lot of my recipe creations are born. I was on a mission to create a lighter version of a Long Island Iced Tea this summer and, thus, the Berkshire Iced Tea was developed. To make, place 1 lemon-ginger tea bag in boiling water and steep for 5 minutes. Remove the tea bag and allow to cool in the fridge. Once cool, add 1/4 cup 100% grapefruit juice, 1 tablespoon vodka, 1 tablespoon rum and 1 to 2 tablespoons chopped mint, if desired. Stir, add ice and enjoy your refreshing beverage for just 100 calories. My 50th birthday karaoke costume party. Check out this guest list: Prince, Abba, The B-52s, John Lennon, The Blues Brothers, Bruce Springsteen, Elvis (aka my husband) and Madonna (me). There were 100 guests, 100 great costumes and 100 off-key crooners. So much fun!